There is a perfect floor for every room in your house, but not every flooring material will work for your budget or your application. What you choose for your flooring material is a pretty big deal. This is not just because of the cost, but the durability of the product, the required maintenance and the value it can add to your home when you decide to sell. When you redo your flooring, you’re going to want it to stay looking good for a long time; it’s going to have to stand the test of time to be worth the trouble. Here’s a list of flooring options to help you match your floor to your décor, your lifestyle and your budget. Simple, comfortable and effective, wall-to-wall carpet used to be the flooring of choice because it could go over anything, and it was quick to install. If you want to change your floor covering, not much goes on quicker than carpet. Although not as common as it once was, one place carpet does still reign supreme is in the basement. There isn’t much out there that’s better for a basement floor than carpet. Because carpet insulates your feet from the concrete slab, it feels much warmer. Carpet also allows moisture to evaporate from the concrete floor; trapping it beneath tile or wood can cause mold and mildew issues. Also, wall-to-wall carpet offers the highest sound-deadening properties of any material. It reflects almost no sound and absorbs a lot that passes through to it. Carpet is not suitable for kitchens, bathrooms or anywhere that might have high moisture. It can trap allergens, even if it is vacuumed regularly. Carpet looks great when it’s well cared for, but don’t count on it looking good after a few years of abuse. Unlike some of the other flooring options in this article, it doesn’t get better with age. Carpet can’t be installed by a homeowner because stretching it properly and matching the seams takes a lot of practise and expertise. Linoleum usually comes in large sheets that are glued down and matched at the seams. Linoleum floors are very common because they are usually inexpensive, quick to install, easy to clean, and offer a bit of cushion and warmth. Lino can also be sold as tiles, which are easy to cut and install. The main benefit of linoleum (at least in sheet form) is that it’s water tight, which makes it perfect for bathrooms and kitchens. Resistance to water and a lower price point make linoleum a staple bathroom and kitchen flooring material for builders and house flippers. Installation is also quick and minimally disruptive. One of the biggest problems with linoleum is that it can look pretty shabby after a few years because the surface isn’t that hard, and dirt can get ground into it. Another issue with lino is that it is sensitive to cuts and heat. Lino tiles are not that waterproof because of the many seams between them, and lino sheet materials can wrinkle and buckle if they are not installed correctly. Damage to a sheet of lino sometimes requires replacement of the whole floor. You can patch it, but it may not match that well – getting it lined up perfectly would be hard. Most often seen in commercial applications, vinyl flooring is usually installed as tiles. You’ll often find vinyl tiles in your local grocery store, or in a warehouse showroom. Vinyl looks modern and simple and is available in many colours, and even some textures to provide better grip. Wax your vinyl tile floors to keep them in good shape – as many coats as you can bear to do. Vinyl is an extremely durable material and can be installed on almost any surface. It is also fairly inexpensive. Vinyl stair treads are also available, but are usually reserved for commercial applications only. Vinyl doesn’t scratch if it is properly sealed and frequently waxed, and it willl not dent at all, although it may crack in high-traffic areas or if installed over a flexible floor. And if vinyl tiles are damaged, they are easy to remove and replace. One major criticisms of vinyl tiles is that they need quite a bit of maintenance. If you look at a floor in a grocery store, it looks pretty good, but keeping it this way requires daily cleaning and waxing. Wax must be used on the floor quite often, and not just one coat. To make matters more complicated, the wax must also be stripped off occasionally to avoid too much buildup. In the last 20 years, laminate flooring has become one of the most popular flooring options for home renovations. You could even say that laminate is the new carpet. Laminate comes in a dizzying array of styles and grades. Choosing one depends on desired colour, texture, thickness and installation method. It is easy to spend as much on laminate as on hardwood flooring, so think carefully about what features you want in a floor. Laminate rarely looks as good as hardwood, but it is much more stable when it comes to temperature, moisture changes and uniformity. Because it is not very sensitive to water damage or moist environments, laminate flooring can be used in pretty much any part of the house, except bathrooms with a tub or shower. 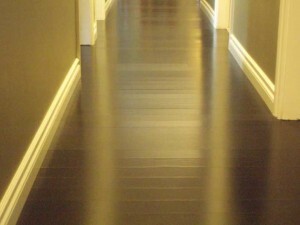 The finish on good-quality laminate also tends to be quite durable and wears well. Staining isn’t a problem and as long as the surface is kept fairly clean, it won’t get scuffed or scratched too quickly either. Installing laminate can literally be a “snap,” thanks to the click-type flooring now available, although a chop saw and small circular or table saw will still be necessary. Most laminate flooring installations are floating floors, which allow expansion and contraction to occur with temperature changes. Not all laminate flooring is created equal. Inexpensive laminates are often less costly because they are quite thin. This means they’ll warp, buckle or bend under pressure more easily than thicker laminates. Thin laminate flooring looks good only for a short time, so try to avoid anything too thin, as it just won’t feel substantial underfoot, and isn’t likely to last very long. But as long as a decent thickness has been used, and the floor has been kept clean to reduce abrasive dirt from ruining the finish, laminate flooring should last for many years, and will generally look good the entire time. The problem is that unlike hardwood, really high-quality laminate can’t be refinished, but they still compete with hardwood in terms of price. Hardwood has been used for hundreds of years as flooring because of its durability, character and insulation. Hardwood is probably the most beautiful flooring type and still the most desirable (at least up here in bone-dry Edmonton). Because it feels warm to the touch and has so much character and depth of colour, it makes a home look both high-end and inviting. Hardwood is hard. Ok, so you knew that. The reason that’s so important is because that means it doesn’t dent and is pretty resistant to scratching. Hardwood can be refinished as many times as its thickness permits, although the sanding, staining and refinishing required to do this are labour-intensive and expensive. Hardwood can still be damaged by water if it sits on the floor for too long or the floor is installed in a damp place. In addition, hardwood is only as good as its finish, so it can look dull or get scuffed if that finish isn’t of high quality. Depending on the type of wood used, hardwood can also fade or darken over time. Some woods and stains can be also susceptible to sun damage. Engineered wood floors are much like a laminate, but the surface is real wood. This means it looks like real hardwood and can actually be refinished like real hardwood, but the substrate underneath is made of other materials – usually softer woods to keep costs down. Engineered wood floors are usually glued together and are installed as a floating floor. The thing with engineered hardwood floors is that they are just as scratch resistant as hardwood because they have the same topcoat – usually an aluminum oxide that is sprayed and baked on at the factory. One big advantage that engineered flooring has over hardwood flooring is that it can be machined to much higher tolerances, meaning the flooring fits together tighter during installation than hardwood usually does. Besides that, engineered floors resist warping and shrinking because they are built like plywood is – different layers glued perpendicularly to each other. This makes for a very strong, stable floor without a lot of thickness. Engineered hardwood provides the look of the real thing at a lower price. The topcoat on engineered hardwood may protect the floors from scratching, but since the substrate is usually a softer wood than the top, gouges and dents are still a problem. The top layer may be hard, but it has nothing to support it, so it still needs to be treated with quite a bit of care – it may not be the best choice for homes with young children and dogs, for example. Also, when it comes to engineered floors, moisture is OK, but too much will cause problems. This means humid environments may be fine, but dampness will definitely be an issue. Avoid installing engineered wood floors where they may get wet from dishwashers, washing machines, showers or bath tubs. Half-bathrooms with no shower or tub should be fine, too. Bamboo has become very popular in the last few years. It is not a wood, but rather a grass that’s compressed into a flooring material. Its desirability stems from the fact that bamboo is a renewable resource and that bamboo flooring is resistant to water. Bamboo flooring is either nailed down for a solid feel or glued together to form a floating floor to allow for expansion and contraction. Because bamboo grows in extremely wet environments, its fibers don’t absorb water like wood does. Bamboo floor is compressed tightly before being machined into tongue-and-groove boards, just like hardwood. For the eco-conscious consumer, bamboo flooring may be the clear winner. Bamboo grows so fast that a shortage is unlikely. That makes prices pretty low as well. Bamboo isn’t the hardest of flooring materials as it isn’t a hardwood – so it can be dented and scratched. It also doesn’t really come in many varieties – unlike hardwoods, which are very numerous – which means it won’t match with all home styles. Like bamboo, cork is a waterproof and renewable flooring material. It is suitable for basement installations and bathrooms as long as the substrate (what the cork is attached to) is also cork so that it is water resistant. Installing cork usually means clicking it together, just like many laminates, or gluing it down like you might do with an engineered floor or vinyl tiles. Because cork isn’t very hard it can’t really dent – it just bounces back. This means scratches may also be less noticeable. Cork flooring is warm to the touch and flexible, making it great for kitchens, where standing for long periods can be fatiguing. Cork’s warmth can also make basements and bathrooms more comfortable. It’s also reasonably priced. Gouges are possible with a cork floor, so it might not be the best pet-friendly floor when it comes to animals with claws. And if you wear shoes in the house, a cut or gouge might happen, too. No high heels on cork allowed! Also, not all homes will look right with cork flooring because of the modern style it’s usually associated with – let’s just say that cork is a little too quirky for most people. Tile flooring is one of the oldest types of manufactured flooring out there. When people learned they could make ceramics out of clay that were hard and smooth, they started using them everywhere – and especially on floors. Tile is still a great option today. Tile offers limitless options when it comes to colour, texture, shape and finishes, which is why it’s so popular. Also, because tiles are so hard, they rarely scratch and are too hard to dent. Tile is also second to none when it comes to wet environments. There is no better floor for a bathroom; tile also works very well in kitchens, laundry areas and entryways. Tile is almost impervious to dirt, so you can almost always clean it no matter how much traffic it gets. Tile is not easy to install and if you don’t get it right, tiles may pop off. You may want professional help with this kind of flooring. Also, grout will need occasional maintenance to keep it intact and looking good. Tile can break if something heavy is dropped on the floor, or the installation has left a lack of support underneath the tiles themselves. And, although tile is impervious to dirt, grout isn’t, which can mean a little more maintenance. Stone doesn’t differ from porcelain or ceramic much except when it comes to maintenance, cost and looks. Real stone tile costs a lot more than man-made porcelain or ceramic. It’s just not that easy to make stone into tiles, but for some high-end homes, the cost may be justified. Stone is beautiful. There’s nothing like a natural material to really make something feel special. Stone is also irregular, which can hide inconsistencies in floors as well as dirt. Stone tile needs to be properly sealed when installed and may need to be resealed occasionally to protect it. This is because stone is often porous, so it can soak up water and oils and become stained. If you don’t mind this happening, some stone may be left unfinished. Any grout lines your floor may have must be sealed even if the stone isn’t. Otherwise, you’ll likely need to re-grout the floor – and more often than you’d think. Because a lot of other things can be changed easier than flooring, when renovating, try to pick a flooring that will last longer than you plan to own the home. That way when you go to list your home for sale, it gives a good impression to buyers. Don’t forget, you’re going to use your floor every minute you’re in your home so choose well and choose carefully. Flooring isn’t just for looks; of all the things you can renovate inside your property, the floor you choose will probably make the biggest impact on your home. People want to stand on a nice, solid floor – it makes the house feel well-built. If a house doesn’t feel substantial, no one will want to buy it. Without a great floor, a house can never be great.